Morning Star Gallery’s Summer 2013 Show introduces artists Norma Fowler, Linda Griffin, and Larry Hultquist , whose art work has never been shown before in Western North Carolina. 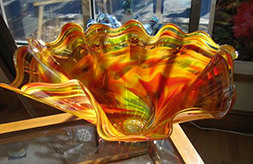 Norma comes to the gallery by way of the North Tahoe Art Center where she served as Executive Director for many years. Her acrylic paintings on canvas show us yet another way of seeing High Country landscapes. Norma plans to conduct watercolor classes in August, so please get in touch if you are interested in honing your skills. Larry comes to Morning Star Gallery by way of the Blue Ridge Parkway where he has been employed for many years as the landscape architect. Surely you can guess his favorite subject for his watercolors! Please drop in and see for yourself just a few of the vistas and tucked away scenes from his unique perspective of the Blue Ridge Parkway. Linda Griffin is an artist in an exploratory mode at the moment! 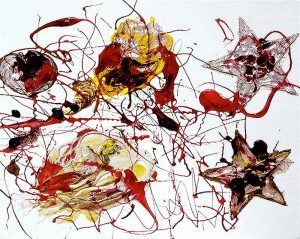 She is very well known for her vivid watercolors of flowers, yet she is working now on colorful abstractions. Morning Star Gallery is showing both her originals and her prints this summer. Morning Star Gallery is featured in the July issue of US Airways Magazine. Readers will find it in the seat back pocket on all US Airways flights during July, and you can read the article by clicking on the following link. We invite you to visit the gallery this summer to see in person the fine art and American crafts that caught the attention of the in-flight magazine. Read the article.